First up is this cute little(well, not really “little“) body pillow from Victoria’s Secret! I think snooze is the thing I hit most in my life! C’mon, who doesn’t want a facebook mug? It’ll only cost you £5.99! Tempted yet? How damn awesome are these teacups? I love the hand painted design on them and I think they’d look brilliant not only as a cup but as a decoration too! Is that sad? I’ve seen this rabbit lamp floating around the blogger world for a while now, I think I’ve even blogged about it before, but I’ve still got my eyes on it! I think it’s just so different and adorable! It’s currently retailing at £79 but honestly, I’m not sure I’d be prepared to hand that cash over right now. If you’ve seen a review on this lamp, link me below! But look, this little fella is only (around) £7! I think the owl lamp is pretty awesome also and a hell of a step down in price from the rabbit, twit-twooo! I love cats and I love quirky art so when I found this painting I was over the moon! Isn’t it amazing? It doesn’t get much better than a cat in a tea cup does it? I just really love the idea of drinking from mason jars every morning, I’m actually pathetic, I know. Who doesn’t want a Jo Malone candle? Have you smelt the things?! Damn, they’re so gorgeous! Admittedly £41.50 is pretty steep for a candle but I think if you’re looking at getting a friend a really nice gift, then you should head in this direction! Once again, I love cats, so why not have salt and pepper shakers in the shape of two cats? Purrfect! I’ve just stumbled across this beautiful Laura Ashley clock and I’m honestly considering making a purchase(as broke as I am) because it’s just gorgeous. At £31.50 it’s more than worth it! Lastly, who’d say no to a Buddha soap dish? I certainly wouldn’t! Available now at Pacsun for £15.46! 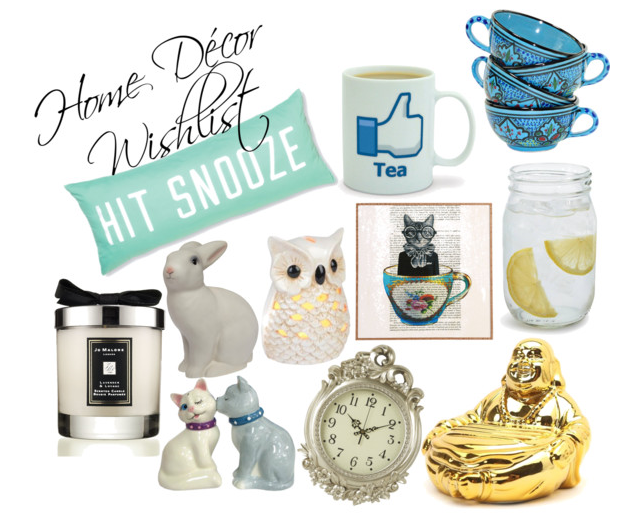 Are you loving any of these items or are you lucky enough to own any of them? Let me know below!